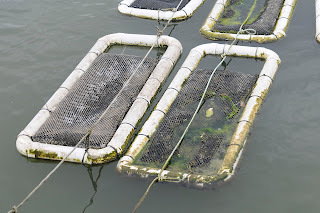 I have recently written several posts about my experiences with seafood, here is one more…LOL I do live in Maryland after all and we have an abundance of water and seafood at our door steps. On Tuesday a group of friends and I visited The Choptank Oyster Company in Cambridge, MD. This was actually a second stop in a day that was filled with exploring and learning. 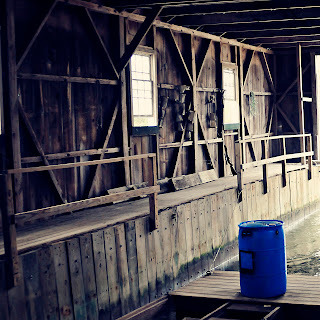 You can read all about my experience with The JM Clayton Company crab processing plant HERE. I have shared lots of pictures, information and links about Maryland Blue Crabs. 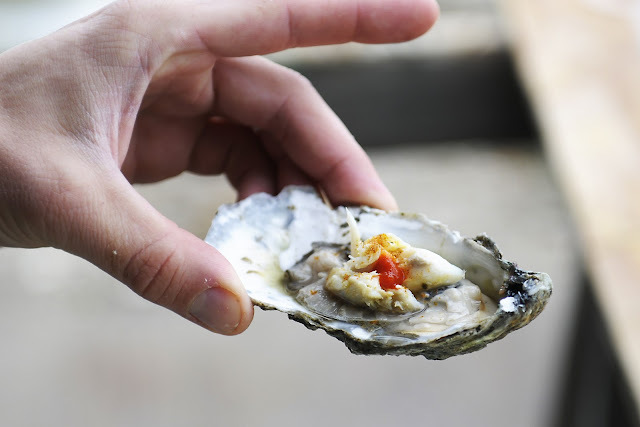 If you have read my blog and previous post, then you know that I LOVE oysters…raw, fried and baked. On Tuesday I was about to encounter a new style of preparing the oyster, on the BBQ. The ease and simplicity of preparing oysters on a wood stoked fire impressed me. The texture and flavor of the oyster was perfect. 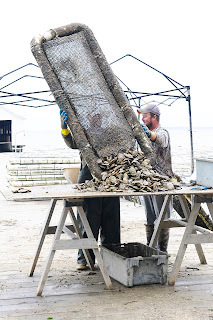 Before we get to the eating and food part of the post let me share with you my experience of going out, viewing and chatting with the men that work behind the scenes at an oyster farm. 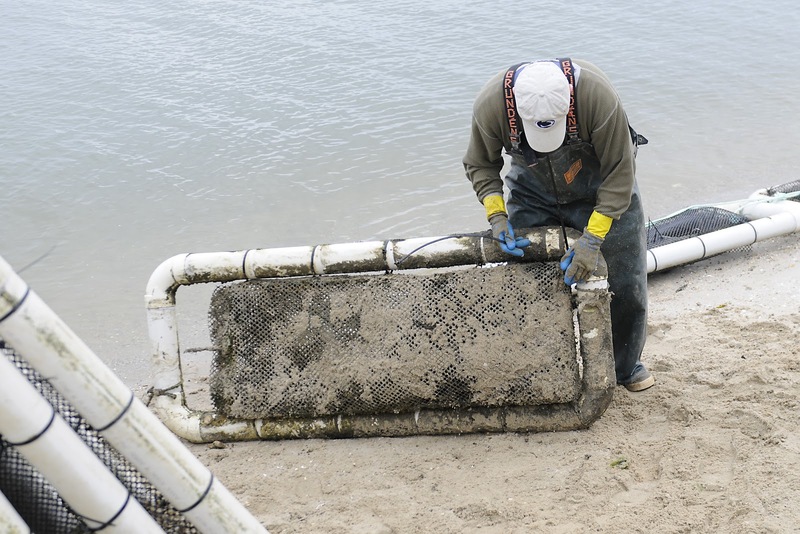 It was no surprise as we left the crab plant and headed further into the country that we would find ourselves along a bank, with water and oysters. 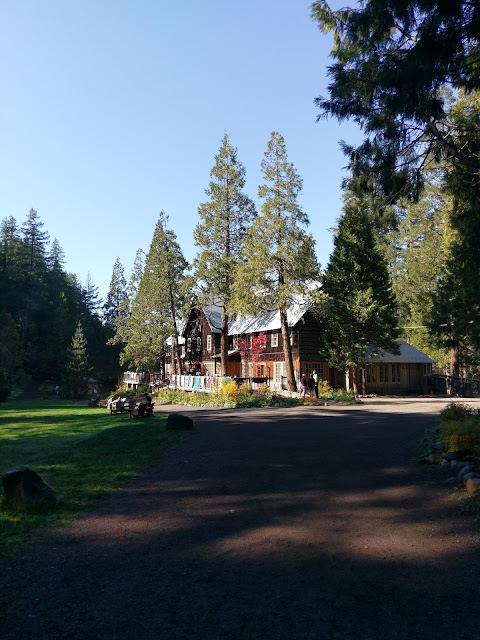 What did surprise us was the beauty of the surroundings. As we headed out of the small town of Cambridge and ventured onto narrow roads that soon turned into gravel we felt a sense of admiration for those families that have lived and preserved this way of life for many years. Each home was surrounded by acres of green fields, some planted with soybeans and others bare, surrounded by broken fences. The homes were in a similar state, some used and worn; others alive and active with friendly faces and smiling children. It was a six mile drive, and with every mile we went deeper and deeper into this soothing environment. You have to remember that we were eight bloggers from the city. 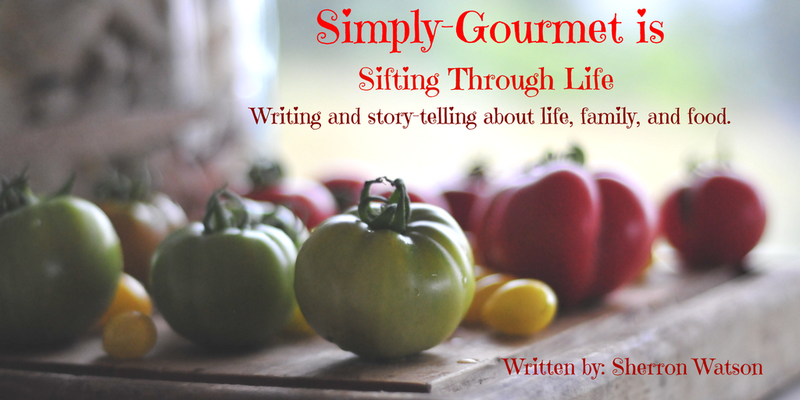 We are all used to a busy pace in our everyday lives and this was quite a contrast. I am not saying those that resided in this quaint community do not lead busy lives, it is just that in the midst of their busy lives they are privy to a certain resonance that the tranquil countryside provides. Driving down the gravel road we passed through a gate of sorts. I wish that I had taken a picture of the gate. It had old medal hinges, a unique design of rock and plaster that must have welcomed friends, families and guest for years. 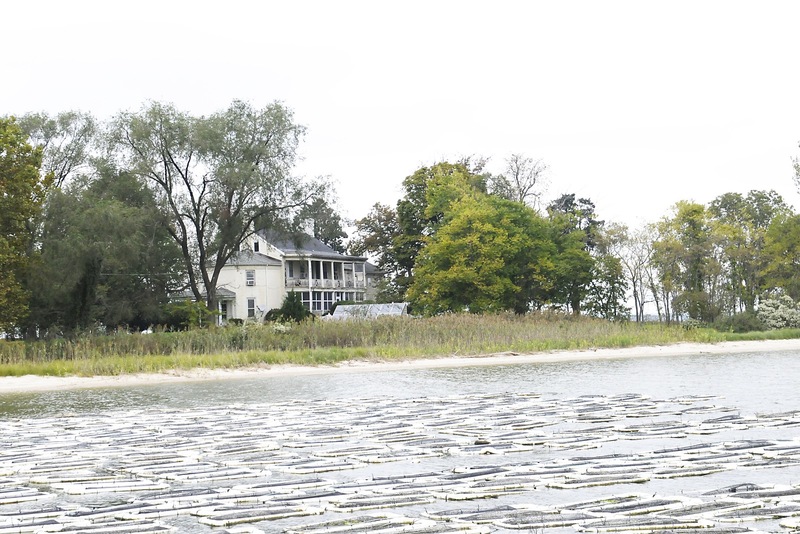 We quickly parked side by side on the oyster farm's lawn. Our group walked the short distance to a path that lead to the shoreline and we were met by a crew of men. 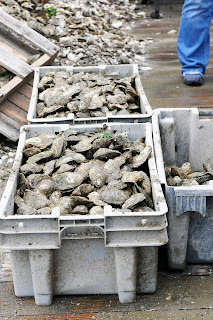 Kevin McClaren is the manager of the farm and would be our source for guiding and teaching us about the oyster process. 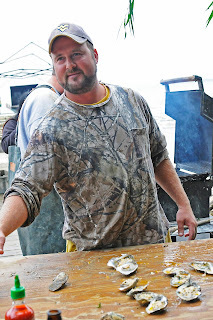 Bubba was on hand to offer any input and provide fresh oysters for our tasting pleasure. There before us, we could look over the water and see the rafts floating on the surface. I couldn't help but notice the youngest of the men on this day, a recent college graduate, was out in the water. He came in a few times as he guided the floats back and forth to the shore. Listening to Kevin talk about the oyster process we quickly learned that it is a constant business of rotation, checking and maintaining. I believe that we went on a perfect day. The weather was cool, but not cold enough that we were longing for our cars with seat warmers. It was overcast. The skies were grey and provided the perfect playing field for taking optimal pictures. If the sun had been brightly shining then our images would have been filled with dark shadows and dark faces. Eager to get started we gathered and listened as the process of growing an oyster was explained. The company is privately owned by a parent company titled: Marinetics. 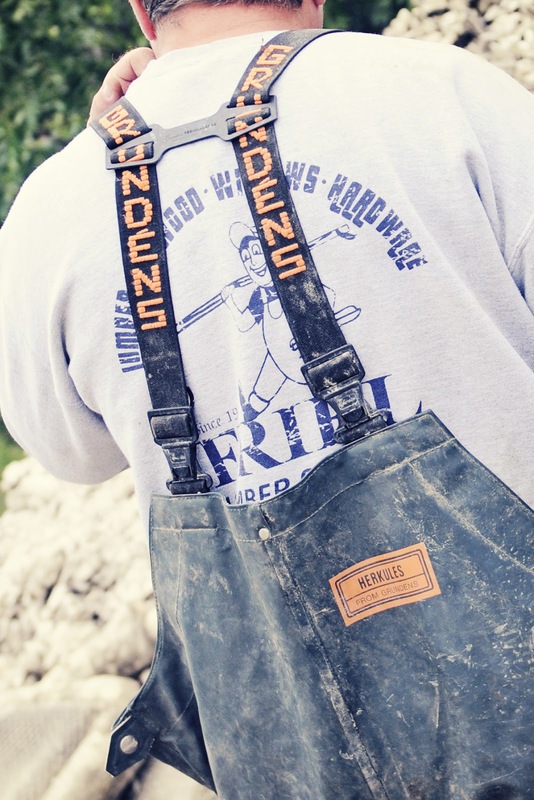 Their website is going to be the best resource to learn exactly how the oysters are raised and grown. I will simply be providing details of what I saw first hand. Please visit their home page HERE. 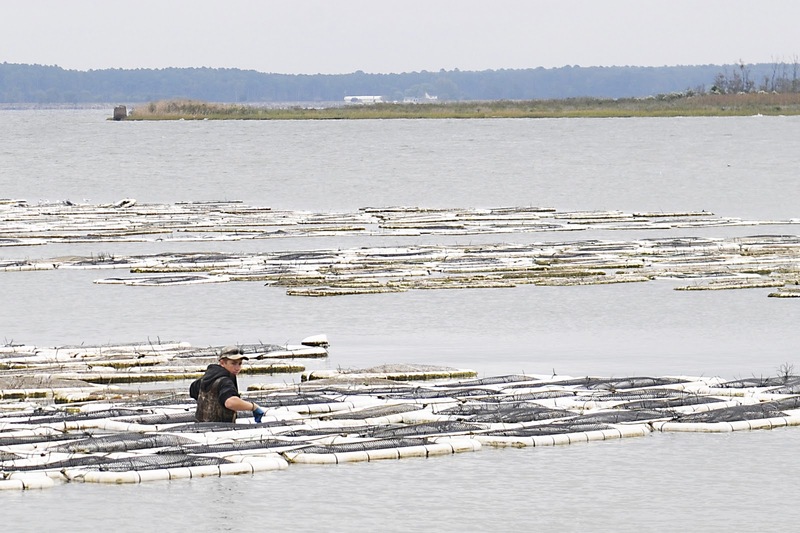 This oyster farm has on hand 10 million oysters. They range from babies which are teeny tiny up to 4 inches in length. The baby oysters are kept in a separate area in what I would call "cribs". A long flat-bed boat will have 8 cribs total. This allows the men to restock the floats on the farm. Kevin mentioned that the team designed these floats. 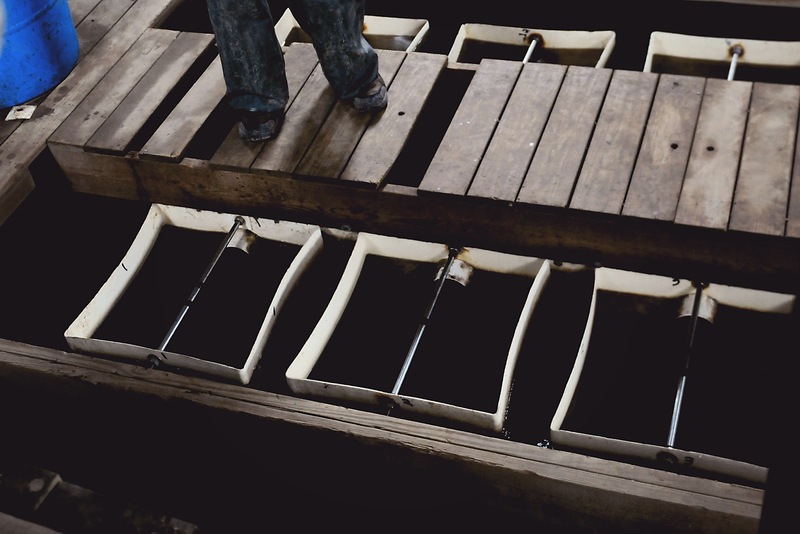 What is wonderful about this system is that the oysters float on top of the water. They do not lay in the sand. Do you know what that means? No grit. No sand. No sudden feeling of cracking your teeth as you bite down on an unfamiliar piece of sand. You can tell that I have had some experience with this and I don't like it at all. I ate 6 oysters while on the farm and NOT ONE had a piece of sand. You can imagine the upkeep the team must face each season in maintaining the floats. If one part of the PVC gets a tiny hole it will start to take on water and before you know it the float is considered an anchor. Kevin pointed to an area of floats that were at least 12 feet tall and many more feet wide of floats that were in need of repair. What causes the holes? 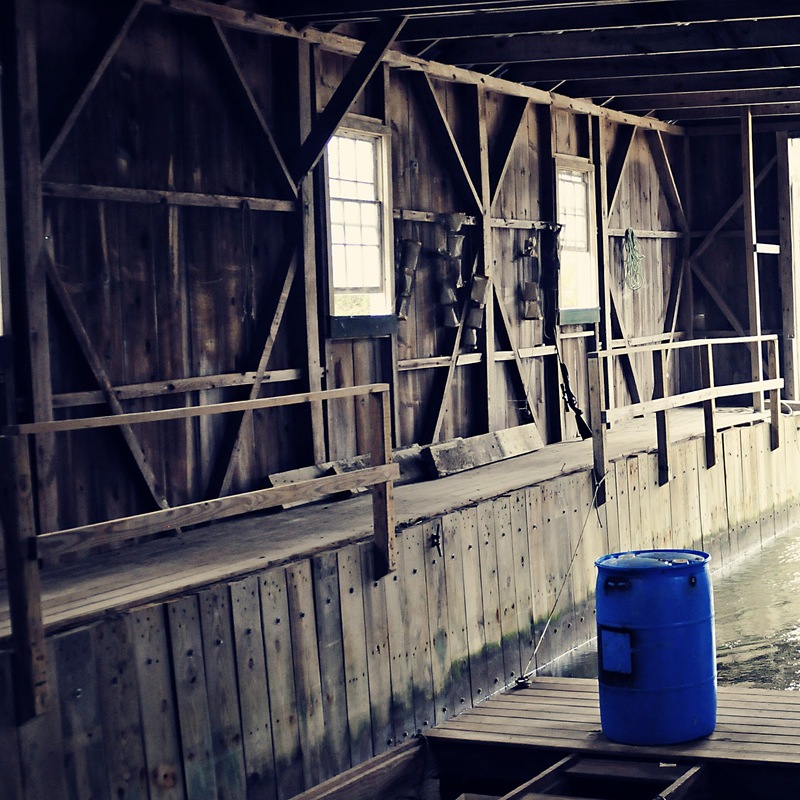 The swaying of the rafts on the water and rubbing up against each other. Over time it weakens the PVC and a hole will be formed. I am not sure of the system of pulling the floats off of the water but while we were there it was a non stop job. 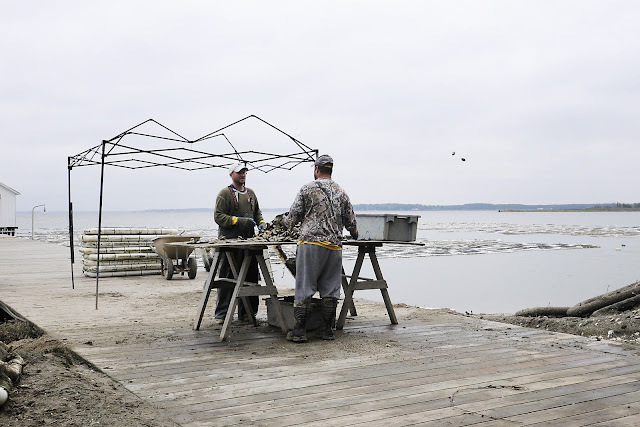 Each float is brought to shore, checked and then split on the end so that the oysters can be released to the top of the table. The table is made of two saw horses and huge piece of ply wood. From what I can understand the oysters grow at different speeds. In one basket you may have small, medium and large oysters. Each float can hold up to 10,000 oysters. As they are opened and piled on the table the sorting and separating begins. It is a quick process. Once sorted they are returned to the correct floats, taken out to the farm and the process will start again with the next float. I had to admire these men. The job appeared to be dirty, wet and I bet at certain times of the year either cold or very hot. They each had water gear, thick gloves and tools of the trade at their disposal. The oyster farm was a great experience and the Choptank Oyster Company has gone to great lengths to provide the consumer with the very best product. Without knowing, I have been buying their products from my local Whole Foods. I can say from first hand experience the flavor and texture are fantastic. How do I know? Bubba was our oyster chef for the day. 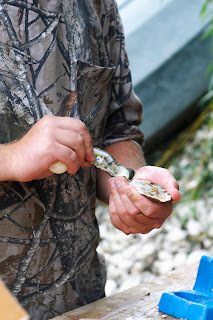 He was a happy gentleman that was willing to share with us the proper technique and skill needed to open an oyster. He must have shucked 50-100 oysters on Tuesday and each oyster was served with a smile. Thank you Bubba! 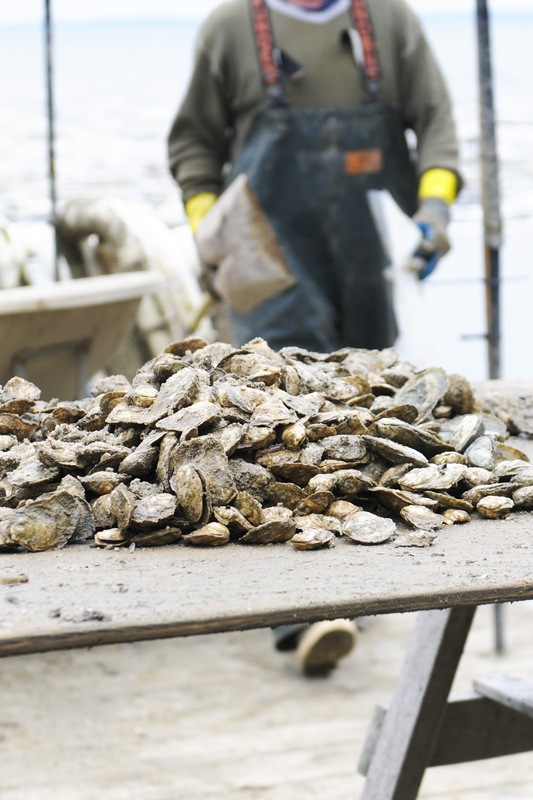 So what does it take to shuck an oyster? A few tools: an oyster knife and a pair of gloves (optional). 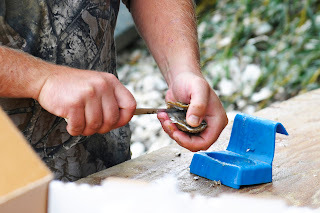 Bubba also had this small box that the oyster could sit in and he could pry them apart as needed. Through the years there have been many failed attempts at opening oysters with the wrong tools. Some of those would be: hammers, kitchen knives or screw drivers. An oyster knife is specially designed to work with the hinge on the oyster. Safety is crucial with shucking or you could easily cut yourself. Eating raw oysters is and will always be a debatable topic. That is not what this post is about because all of those on the tour ate our fill. We know the risk and it was something we were willing to take. As with most situations of eating anything related to seafood please use caution that what you are eating smells good, looks okay and taste great. If at anytime any of these three things don't happen then immediately dispose of the product. I have found that I enjoy raw oysters with something added to the top. That something can be lemon juice, cocktail sauce, salt and pepper, chives, horesradish sauce or soy sauce. On this day we were treated with Sriracha Sauce, fresh crab from Epicure Crabmeat and Old Bay Seasoning. Our second option was having a cooked oyster that had been prepared with butter, parmesan cheese (?) and green onions. 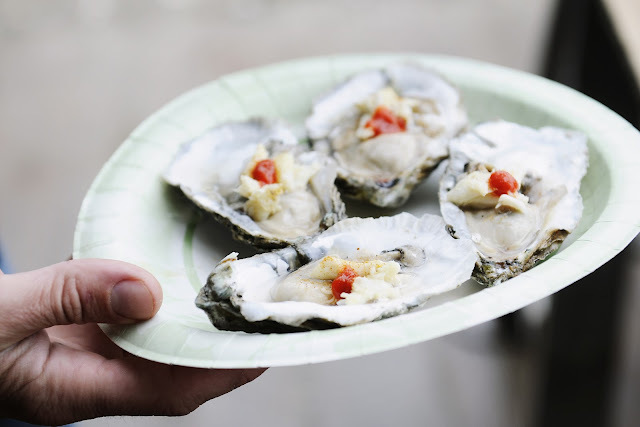 Each oyster was placed on the grill with their added topping. The lid was closed and the oysters baked. I would say they took about 5 minutes…it was fast. I look forward to having these oysters again and trying my own on the BBQ grill for friends and family to enjoy. The oysters we had were a real treat not only for their flavor but because these oysters were grown in my back yard…the Chesapeake Bay. If you like fried oysters, I have a version that I make HERE. The eight bloggers that I had the pleasure of going on the tour with will also be providing their own versions. I am going to be sharing those here if you would like to check them out. We all had camera's and so I know that more pictures and perspectives will have been captured. Beautiful post Sherron. It was a wonderful trip and you've captured so much of it in your stories and fabulous photos. I was so pleased to find this post as I live in Cambridge, MD ! Thank you for writing such a beautiful account of your visit to my little neck of the woods. I am once again reminded of how fortunate and grateful I am to live in such an area, surrounded by all the joys nature has to bring. At the moment, I am sitting on my front porch looking out over the Choptank River, the water is a magnificent deep blue and our local Blue Heron just flew by . I am blessed ! Yes I did read it. Fabulous 'behind the scenes' account of of a very labour intensive industry. I have the greatest respect for those ladies who work so diligently and with such focus. I can't pick a crab to save my life ! You too have a great week-end....the weather is just perfect for me !